On a Thursday afternoon last semester, a diverse group of 50 students gathered to learn about the art of storytelling from Eladio Abreu, a lecturer in the biology department. This was an unusual topic for these students, but they sat enrapt, not distracted by cellphones or laptops. The weekly seminar was part of the Emory Initiative to Maximize Student Development (IMSD), aimed at the professional development of undergraduate and graduate students in STEM fields. 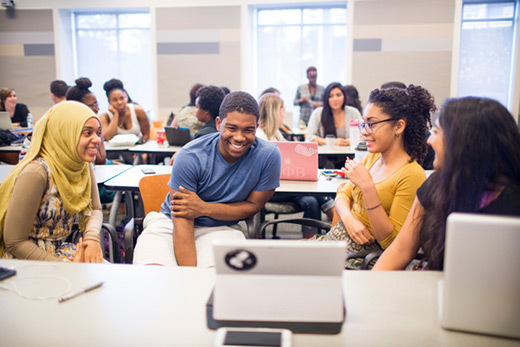 What sets this program apart is its commitment to increase diversity in the biological, biomedical and behavioral sciences by nurturing students who may be underrepresented in these fields. The program includes some of Emory’s strongest students, according to Amanda James, IMSD assistant director. The two-year, NIH-funded research program has three main goals: preparing undergraduate students for doctoral programs in STEM fields, nurturing graduate students during their matriculation into Emory’s PhD programs and increasing diversity through mentoring. The program accomplishes these goals by connecting undergraduates and graduates through mentorship, seminars and career coaching, says Keith Wilkinson, IMSD director and vice-chair of the Department of Biochemistry. Along with the lecture on storytelling, this meeting included updates from students on their summer research plans. Answers ranged from epidemiology research with a children’s hospital in Philadelphia to influenza research at Johns Hopkins University. In addition to weekly seminars, IMSD offers classes aimed at increasing success post-graduation, workshops for career development and pathways to funded research, a rare commodity for undergraduates. Students who can’t do funded research may use resources that IMSD offers to find other opportunities. Lina Jowhar is an undergraduate who started the program in her third year at Emory. She is engaged in research on cystic fibrosis, a genetic disorder of the lungs, and she values the weekly meetings, particularly Abreu’s lecture on the art of storytelling. As a black, first-generation college student, these questions are important. Walker praises one of the earlier weekly seminars in which IMSD graduate students led an open forum. Walker says she appreciates having an outlet for these conversations, in which students address topics that may bring feelings of vulnerability. The program focuses heavily on mentorship and relationships between the students and program leaders, Emory faculty and IMSD alumni. Graduate students are frequently paired with a small group of undergraduates for breakout sessions during seminars and many mentor their undergraduate counterparts. “Everyone who succeeds has a good mentor,” says Pat Marsteller, undergraduate director of IMSD and a professor of practice in the biology department. The program is dedicated to “improving mentoring cultures and nurturing talent from underrepresented student groups,” says graduate director Eddie Morgan, professor of pharmacology. As IMSD assistant director, James has been able to build an especially strong rapport with students; for example, she helped Walker work in a lab with individuals who were familiar with being a first-generation college student. James says she strengthens her relationship with students by “finding shared experiences and opening up about her personal struggles," which helps them feel comfortable discussing their own issues and concerns. Soon, IMSD undergraduates will start their summer internships. Some will be part of Emory's Summer Research Programs, formerly known as the SURE (Summer Undergraduate Research at Emory) program, that Marsteller began 28 years ago; others will be going off-site to similar programs promoting undergraduate research like the Leadership Alliance at Brown or the Howard Hughes Medical Institute EXROP program. Meanwhile, Wilkinson, Marsteller and James will focus their attention on preparing for the new graduate fellows and planning for next year. While happy about how things are going, Wilkinson is looking ahead for expansion — he hopes to soon have a regular bus service from Atlanta University Center and other schools in the area so that more students can participate in the weekly seminars and join the research community.